Governor Larry Hogan today attended the 9th Annual Maryland Green Schools Youth Summit, held at Sandy Point State Park in Annapolis, where he greeted more than 2,750 students and educators from across the state. The governor congratulated the students and schools on achieving the Maryland Green Schools Award from Maryland Association for Environmental and Outdoor Education, and presented a Governor’s Citation to the organization’s Executive Director, Laura Johnson Collard. “To the students here today – your understanding of conservation, and your role in creating a green and healthy environment will be important for any job or career you choose to pursue,” said Governor Hogan. “To all of the teachers and schools represented here today – thank you for ensuring that Maryland students have opportunities to participate in these important and educational stewardship projects.”This year’s Youth Summit theme, “Changemakers Today for a Greener Tomorrow,” acknowledges the actions that students take to conserve resources, and have a positive impact in their schools and in the communities in which they live. For many of these students this will be their first visit to the Chesapeake Bay. The Youth Summit included a Green Career Fair where students learned about career pathways and asked questions to professionals. Students participated in an Environmental Literacy Fair. Forty exhibits provided students with an opportunity to do Environmental Education hands-on activities such as building a buoy, learning about songbirds, investigating oysters,and other Chesapeake Bay-related activities. 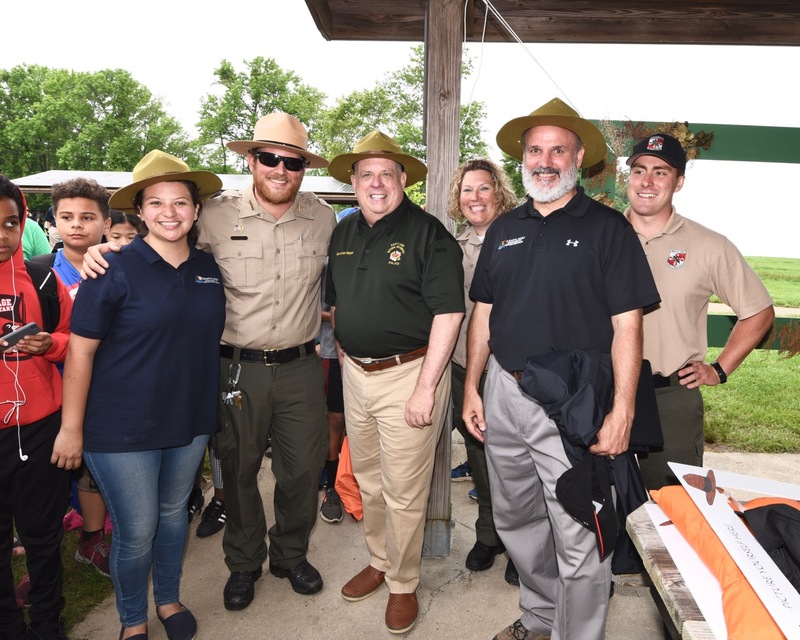 Governor Hogan, along with Maryland Natural Resources Secretary Mark Belton, Environment Secretary Ben Grumbles, and Education Deputy Superintendent Carol Williamson, joined the celebration with more than 100 schools as they are received their Maryland Green Schools awards and Green Flags. Announcements were made on Earth Day April 21, when 147 schools were awarded and are part of the 621 Maryland Green Schools, representing 27 percent of all Maryland schools.